Rehabilitation is only possible in motion. In this case eccentric training is the key factor especially for older horses as well as those in need of a rehab program. 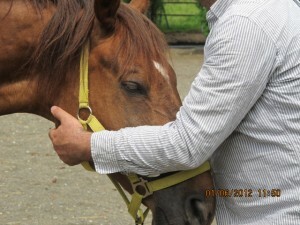 The work will help the horse to use his spine in a new functional way. More and more attention will be given to the role of the back. New questions will be asked and new answers will be found by the horse through a new kinesthetic approach. The model of the kinesthetic dynamics in this way allows the use of a new postural-skeletal system suited for the performance.